Udee Bangkok kohteessa Bangkok, Thaimaa: Varaa nyt! Kääntäjä: Haluamme Udee Bangkokin sijainti rauhallisella kadulla ympäröi ruokakojuja. Se sijaitsee lähellä Chatuchak Weekend Market sekä metro-ja Skytrain. Tämä puhdas, tyylikäs ja viihtyisä hostelli on henkilökunta, joka on erittäin hyvin mitoitettu täällä Hostelworld niiden tuntemus off-the-pahoinpideltiin-radan tekemistä Bangkokissa. Meidän matkustajat sanovat henkilökunta luovat "rentouttava, go-with-the-flow ilmapiiri" ja että he suosittelevat sitä "kaikille etsivät mukava ja kaunis paikka". Yksi käyttäjä kertoi meille se "ei ole osapuolena hostellissa, mutta se on helppo löytää ja yhdistää ihmisiä" täällä. Udee Bangkok is a little home with greenery surrounding to welcome travelers who prefer the simplicity of homelike and cozy staying. Here, our guests will experience the real Bangkokians way of life. 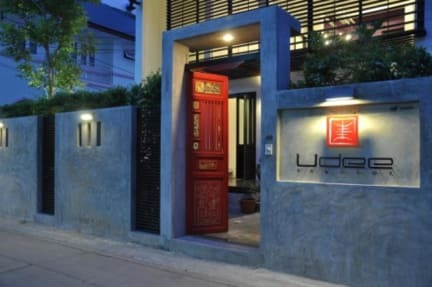 Our name Udee means a well residing in Thai language. Our hostel decoration has represented superb combination between Thai and modern Chinese style. Our hostel is near Chatuchak weekend market, the biggest flea markets of Thailand and South East Asia. The market is well known to all Thais and tourists as the market that has everything you want So it's one of the place, you should not miss!! Siam Centre, the shopping area that provides you a variety of activities ranging from shopping, dining, spa & massage, movies and all entertainments. The famous shopping centers in this area are Siam Discovery, Siam Centre & Siam Paragon for luxury brand name merchandises. Electronic accessories, mobile phones, gadgets, sporting goods and trendy apparels are abundant in Ma Boon Klong or MBK Centre. Our hostel is the oasis of street food vendors; while staying here, you can experience the taste of traditional Thai food such as Pad Thai, Tomyum Kung, steamed rice with chicken, fish-ball noodle, wantan noodle soup along with Thai dessert and various fruits of your choice. Recommended restaurant near our hostel, Shimi, an all-you-can-eat Shabu-Shabu restaurant. The Villa at Ari station 5 minutes away from Saphan Kwai station provides Thai, Japanese and western restaurants at your choice. Villa supermarket also serves all kinds of foods and beverages. You can also find plenty of typical Thai foods at reasonable price in Soi Ari (Ari Lane) opposite of the Villa. Located out of hustle area, our hostel provides you a relaxing atmosphere with comfortable and clean room as awarded by Hostelbookers. Our hostel is easy to access to public transportations [sky train, public bus and taxi] which facilitate your transfer to all major tourist attractions such as Grand Palace, Khao San road or China Town. Bang Sue Railway Station and Northern and North eastern Bus Terminal are 10 minutes away by taxi from our hostel. Bangkok Railway Station (Hua Lum Phong) and Southern Bus Terminal are 45- 60 minutes away by taxi. Tourists can easily continue their journeys to all destinations in Thailand. Victory Monument Sky-train Station, where the Private Van Terminal serving central parts of Thailand (Pattaya, Hua-Hin, Kanchanaburi and Ayudhaya) is located, serves you with economic transportation to all major destinations around Bangkok and its proximities. All rooms are air-conditioned, clean linen and towel, clothes hanger and head-to-toe shampoo in all bathrooms. *Please note that our hostel has no elevator. If you come back late at night please use the doorbell at the front gate, our security guard will let you in. 1.Smoking is friendly only outdoor. 2.Unregistered guests are not allowed in the resident area except lobby. 3.Passport or ID card is strictly required to present for check-in. 4. Balance due is requested upon check-in. 5.Any lost or damage of the key card will be charged at Baht 300. 6.Family traveling with children under 18 years is recommended to book private room or family room. Kid under 3 years share bed with parent is free. An extra bed can be requested at certain type of room at Baht 500 per night therefore please inform us in advance to ensure that an extra bed can be provided. 7.All Facilities are provided for only in-house guests, after check-out, using some of our facilities (shower, left luggage) will be charged upon you request. 8. In the event of a no-show, the total amount of the reservation will be charged to your credit card. Kääntäjä: Meidän hostelli on viihtyisä koti-away-from-home Bangkokissa. Huolimatta sijaitsee yksi vilkkaimmista kaupungeista maailmassa, meidän hostelli on pieni pala seesteisyyttä ja rauhaa sykkivän. Suosittelen, että vieraita käy, Chatuchakin, viikonloppu markkinat, josta löydät kaikki mitä voisit kuvitella. Markkinoilla on kävelymatkan päässä meidän hostellissa tai nopean matkan päässä julkisilla liikennevälineillä. Kaikki Bangkokin nähtävyydet ovat helposti tavoitettavissa Skytrainilla, metro-, bussi-tai muilla julkisilla kulkuvälineillä. Mielestäni parasta naapuruston me \ 'uudelleen vuonna on määrä ruokakojuja ja hienoja ravintoloita. He \ 'uudelleen kaikki kävelymatkan päässä ja voit kokeilla kaikki ruoka, joka Bangkok on tarjota! Jos haluat paeta kiireisen kaupungin, mielestäni meidän hostelli on täydellinen paikka rentoutua ja jakaa drinkin ja jutella muita matkailijoita ympäri maailmaa.